A senior adviser to Mitt Romney appeared to undercut a central argument Republicans hope to use between now and the November election against President Obama - that although his signature health care reform law may be constitutional, it amounts to a tax. 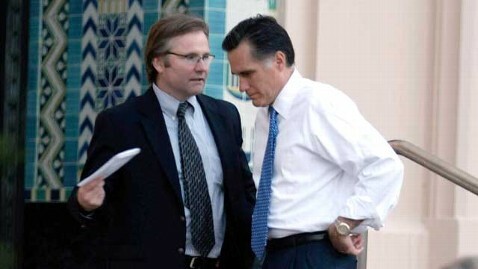 In an appearance on MSNBC's "Daily Rundown," Romney strategist Eric Fehrnstrom was asked whether Romney agreed with last week's Supreme Court ruling. "The governor believes that what we put in place in Massachusetts was a penalty and he disagrees with the court's ruling that the mandate was a tax," Fehrnstrom said. When pressed by host Chuck Todd about whether Romney supported calling the financial burden placed on Americans who choose not to buy health care "a penalty or a fee or a fine" rather than a tax, Fehrnstrom replied: "That's correct." But his assessment differs from that of top Republicans who are trying to turn the Supreme Court's decision into a campaign talking point. "The president said it was not a tax," Senate Minority Leader Mitch McConnell, R-Ky. said in an interview on "Fox News Sunday" over the weekend. "The Supreme Court, which has the final say, says it is a tax. The tax is going be levied, 77 percent of it, on Americans making less than $120,000 a year. So it is a middle class tax cut - tax increase." McConnell's position was echoed by House Speaker John Boehner, R-Ohio, who appeared on CBS's "Face The Nation." "The American people do not want to go down this path," Boehner said. "They do not want the government telling them what kind of insurance policy they have to buy and how much they have to pay for it, and if you don't like it, we're going to tax you." "The Supreme Court left President Obama with two choices: the federal individual mandate in Obamacare is either a constitutional tax or an unconstitutional penalty," Henneberg said. "Governor Romney thinks it is an unconstitutional penalty. What is President Obama's position: is his federal mandate unconstitutional or is it a tax?" But the Romney campaign's position appears to give President Obama some political cover now that Republicans are signaling their intent to go on the offensive. "Now, as the Republican Party and their super PACs try to depict this narrow, freeloader penalty, that would touch less than one percent of Americans, as a broad tax on the middle class, they're sliming their own nominee, as well," senior Obama campaign strategist David Axelrod told the Washington Post's Greg Sargent. Axelrod noted that Romney, who signed into law a similar health insurance mandate in 2006 as governor of Massachusetts, has defended a penalty but refused to call it a tax. "We said, look, if people can afford to buy it, either buy the insurance or pay your own way," Romney said during a 2008 GOP primary debate. "Don't be free-riders." The argument is the same one made by the president and senior administration officials, all of whom still refuse to call the penalty a tax, despite the Supreme Court's ruling. "[Chief Justice John Roberts' went through the different powers that Congress has, and he found that there is a power - whatever you call it - to assess a penalty like this," said White House chief of staff Jack Lew Sunday on "This Week." "He called it a tax. So you're conceding that?" interjected ABC's George Stephanopoulos. "I'm saying that it was set up as a penalty for people who chose not it buy insurance even though they can afford it and, for that 1 percent, we call it fair," Lew said. President Obama had previously defended the penalty as "absolutely not a tax increase" during a 2009 interview with Stephanopoulos. "My critics say everything is a tax increase," Obama said at the time. "My critics say that I'm taking over every sector of the economy. You know that." "But you reject that it's a tax increase?" Stephanopoulos asked. "I absolutely reject that notion," Obama replied.